The long-awaited book on Desert Road Archaeology in Ancient Egypt and Beyond finally seems to be here! Edited by Frank Förster and Heiko Riemer of Cologne University, and with 25 individual contributions, it is the yet most complete survey of ancient desert roads in Egypt. My own contribution to the book is written with Elizabeth Bloxam, Tom Heldal and Adel Kelany; a chapter on the amazing ancient roads at the west bank of the Nile at Aswan, in the First Cataract region. We review the area’s complex network of long-distance Pharaonic and Roman roads, more recent camel trails, and not least the best-preserved quarry roads in Egypt; the 20 km paved and cleared network from the “quartzite” quarries at Gebel Gulab and Gebel Tingar. Read extended abstract, view paper at academia.edu, see maps and view image gallery! Our paper is based on archaeological survey from 2004 to 2008, carried out within the QuarryScapes project. Also, it uses satellite imagery, especially Google Earth, which is an eminent tool in “following” desert roads. A most significant find is a broad, cleared road leading from West Aswan, bypassing the difficult terrain along the First Cataract and connecting with previously known Roman roads in Lower Nubia. This implies that up to 100 km of the Roman roads mentioned in the famous, probably 3rd century AD Antonine Itinerary is still preserved in this region. The survey has also confirmed a previous account of a partially cleared road to the Kurkur oasis that may date to the Pharaonic period. The previously known 20 km long quarry road network associated with the major silicified sandstone (or “quartzite”) quarries at Gebel Tingar and Gebel Gulab has been re-interpreted and shown to consist of specific logistical units of New Kingdom and Roman date. 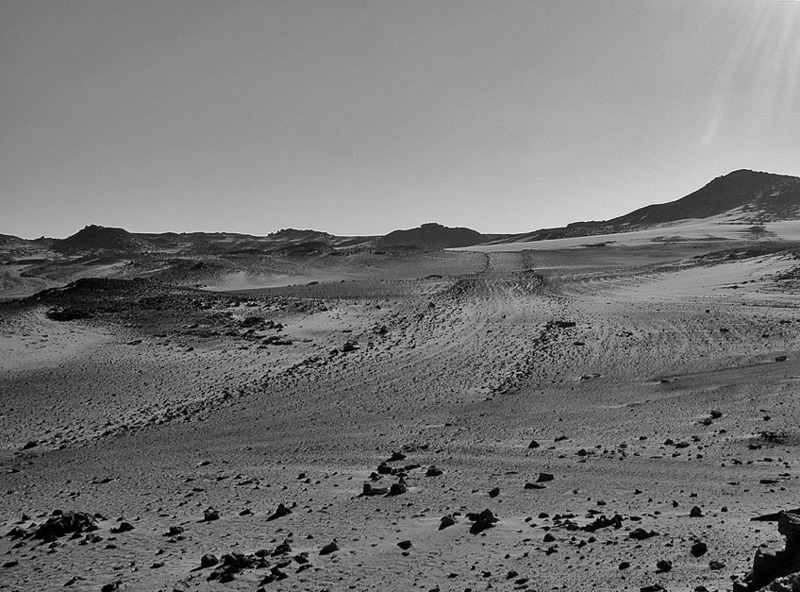 These paved and cleared roads are distinguishable from the much broader, cleared desert roads. Camel caravan trails, which may have antecedents as very old donkey tracks and general travel routes, criss-cross the area, leading to at least two main termini by the Nile; one opposite the ancient settlements at Elephantine and Aswan, another further north by Wadi el-Faras/Sheikh Mohammed. The latter discovery adds to the significance of this previously little-known place by the Nile. Archaeological features along and at the termini of the routes are discussed, especially large fields of upright stones, which are considered sacred places in this multilayered archaeological landscape. Such standing stones were in part put up and used by travellers heading out in the desert or coming back from a successful journey. Please contact me if you would like a PDF of the paper. And make sure to have a look at the leaflet for the book. The publisher, the Heinrich-Barth-Institute, says: Recent exploration has revealed an amazing network of ancient roads and paths crossing the forbidding Saharan desert. This evidence broadens scientific horizons and launches a fascinating new field of archaeological research. This entry was posted in Ancient Egypt, Archaeology, New publications, Old quarries and tagged Ancient Egypt, ancient egyptian quarries, Aswan, desert roads, Gharb Aswan, Nubia, Roman roads. Bookmark the permalink. I am very much looking forward to reading this paper. I have enjoyed visiting the Quarryscapes website ever since Elizabeth Bloxam supervised my MA dissertation at UCL way back in 2007-8. Please can a PDF be forwarded to my email address?